Technically, this isn’t a “selfie” since Amanda Shires took it, but I’m in it. I guess there’s been some misattribution of this posts title. In fact, it was Hillel the Elder who famously said, “If I am not for myself, who will be for me? If I am only for myself, what am I? If not now, when?” Huh… I thought I’d heard it in a movie, but anyway, it helps kick off a post about not procrastinating. The Red Rocks Amphitheater has been on my mental “bucket list” since seeing U2 Live At Red Rocks: Under a Blood Red Sky, a film documenting the bands 1983 performance there. The movie propelled the band. The irony is Red Rocks was half full. “Jayonce” – Jay and I worked together at Kronos, and we always connected. Maybe it was demographic, love of music, or some other human connection we can’t really define. Whetever the reason, it was great to chat over lunch at Red Rocks, peruse the music museums there, and hang out before the show. Jason, Amanda, Sadler, Derry, Jimbo, Chad, Frank, Ben, Matt, Nigel, Tarrant, and the other members of Amanda’s band who will have to remain nameless since I cannot find their names. – They rocked the rocks. 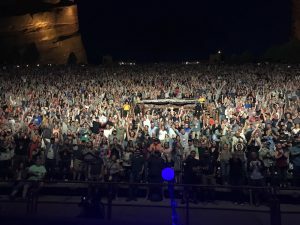 It seems to me that when bands play Red Rocks, it’s like their SuperBowl, and they up their game for the occasion. Jason Isbell and the 400 Unit, Frank Turner and the Sleeping Souls, and Amanda Shires and her band played with high energy and absolutely killed it. I had pretty high expectations, and they were exceeded. Tom and Heide – College friends that I haven’t seen in over 30 years, but time being relative, it seemed none had passed. We had a great time reminiscing and catching up in Heide’s beautiful home of Breckinridge. The backdrop to this experience was beautiful Colorado. I hadn’t been there since a 1981 road trip to see the Stones with college buddies. Life was different then. It took four of us about a nanosecond to decide we would embark on the 1,800 mile round trip from Tucson to Boulder. Now it takes a little more time, but the experiences are just as rewarding. I was thinking I would write a profound response, but decided to wait. It was great reconnecting Leo. Glad we got to see such a terrific show. The amphitheatre has been around for a hundred million years (give or take 50 million) and Is probably not going anywhere. Now that you know where it is, maybe you could catch another one. Jayonce will be minutes away. Awesome Leo! I wish I could have gone! But I totally agree with the sentiment of “if not now, when”. Recently I heard someone preach about taking a step, to just do something! I really took that to heart and I’m doing my best to live that every day.